Marvel Confirms How to Pronounce Venom's "Symbiote"
When the full trailer for Sony and Tom Hardy’s Venom movie dropped, controversy arose over the way Jenny Slate’s character pronounced the word “symbiote.” Today’s Amazing Spider-Man #800 seems to spell out the pronunciation pretty clearly, thanks to longtime Daily Bugle editor-in-chief J. Jonah Jameson. 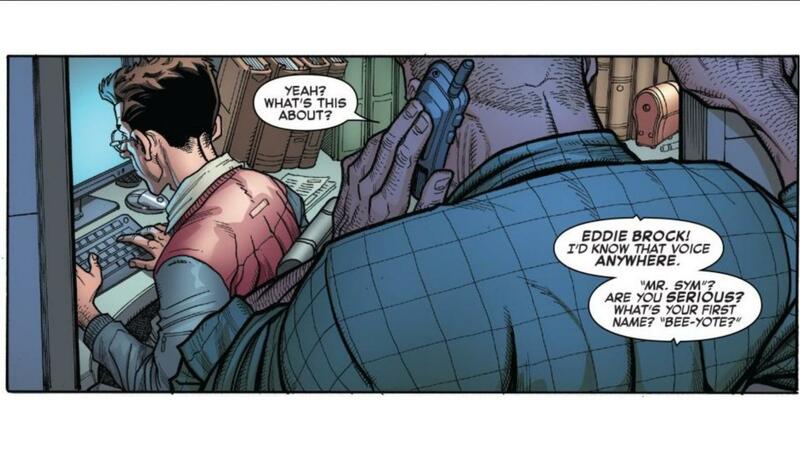 SPOILERS for Amazing Spider-Man #800 follow. In the Venom trailer, Slate’s character pronounces “symbiote” with an odd emphasis on the middle syllable, so that it comes out sounding like “sim-BYE-oat.” J. Jonah Jameson disagrees. In Amazing Spider-Man #800, Spider-Man is busy dealing with the Red Goblin, two of his greatest enemies - Green Goblin and Carnage - combined. This is made especially dangerous by the fact that J. Jonah Jameson recently discovered that Spider-Man’s secret identity is Peter Parker, and Red Goblin managed to get that information out of Jameson. After Red Goblin wipes the floor with several of Spider-Man’s superhero allies, he sets his sites on Mary Jane Watson next. Jameson is desperate for a way to make up for putting Peter and his loved ones in danger. He sees a photo of Venom in a newspaper and notices that the photo credit is given to a Mr. Sym. Jameson starts to think, now knowing that Peter Parker was essentially taking selfies of himself as Spider-Man to sell to the Bugle for all those years, and he realizes that Eddie Brock, whom Jameson thinks of as a poor man’s Parker, is running the same scheme as Venom. He decides to call Brock to try to force Venom into helping protect Mary Jane. That’s right, Jameson asks specifically if his first name is “BEE-yote,” not “BYE-oat,” suggesting that this is how characters in the Marvel Universe pronounce the word. Now, one could argue that this is just Jameson’s pronunciation and there’s no way to know if it is the correct pronunciation, but Jameson was the editor of a big New York City newspaper that probably covered symbiotes more than most and is one of the few people to actually have friends who have worn a symbiote, so he’s as close to an authority as fans have. Is this how you’ve always pronounced symbiote? Do you trust Jameson’s interpretation? Are you excited for the Venom movie? Let us know in the comments section! Amazing Spider-Man #800 is on sale now.